I have an older OSLO LNB which, was my spare for the websdr. Now i want to use it for QO-100. To improve the temperature stability a TCXO was fitted in place of the original crystal. Find some pictures below. The type is a TXC 7N-26.000MBP-T from TXC. It works from 2.7 to 5.5V. Luckily the LNB works with 5V from an 7805 regulator. 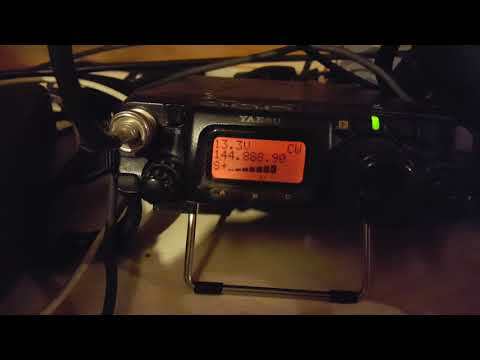 The TCXO was supplied by Michael DG0OPK. He suggested this type and already modified a OTLSO some years ago. Some warning: This might not apply to current types of the Octagon LNBs. As far as i know you will likely get a 25MHz crystal version if you try to buy one. 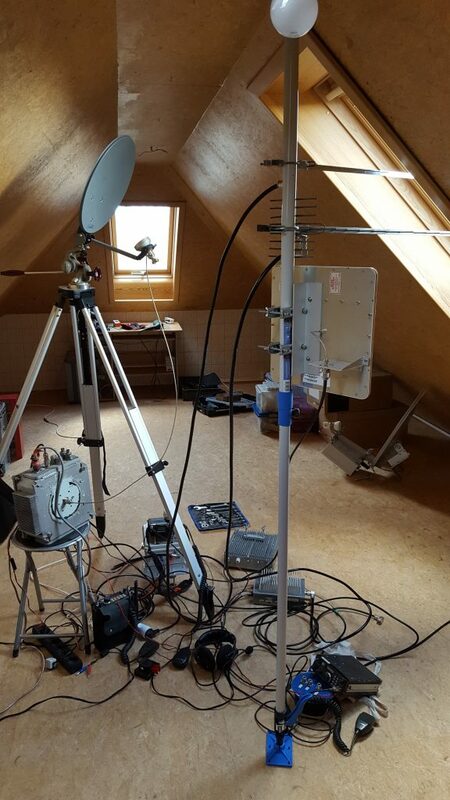 It will not be possible to use the 25MHz LNB with a lower reference frequency. First i removed the crystal. It is necessary to use hot air because otherwise the pads might be damaged. But they are still needed. Also the 0 Ohm resistor over the two traces that go between the two pads needs to be removed. The trace connected to the former crystal pad closer to the RF section needs to be disconnected. This crystal input will be left unconnected. 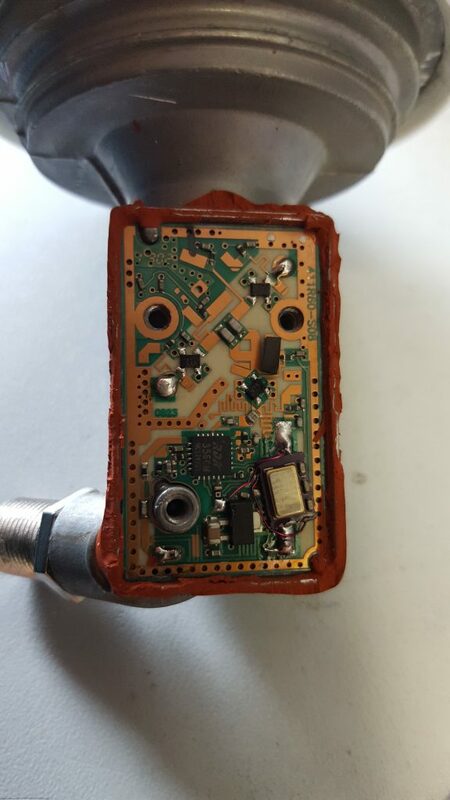 Now a insulated copper wire can be connected to the pad of the former 0 ohm resistor that leads to the converter IC. The capacitor to ground at the crystal pad close to the 7805 regulator needs to be replaced by a short. The other crystal capacitor should be replaced by 100nF. Now the TCXO can be soldered. It is important to avoid shorts of the pins of the TCXO towards the PCB. I soldered the TCXO slightly elevated. 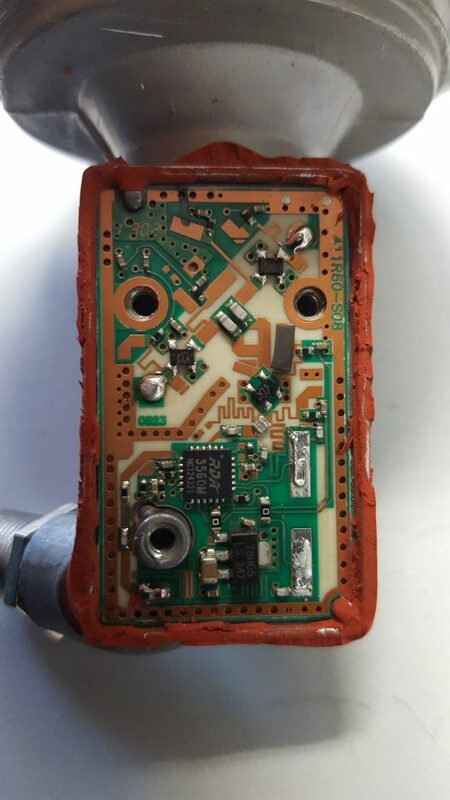 It is important to keep distance from the border of the PCB because the cap of the LNB still needs to be mounted. The insulated copper wire can be connected to the output of the oscillator which is pin 5 (right of the row of capacitors). 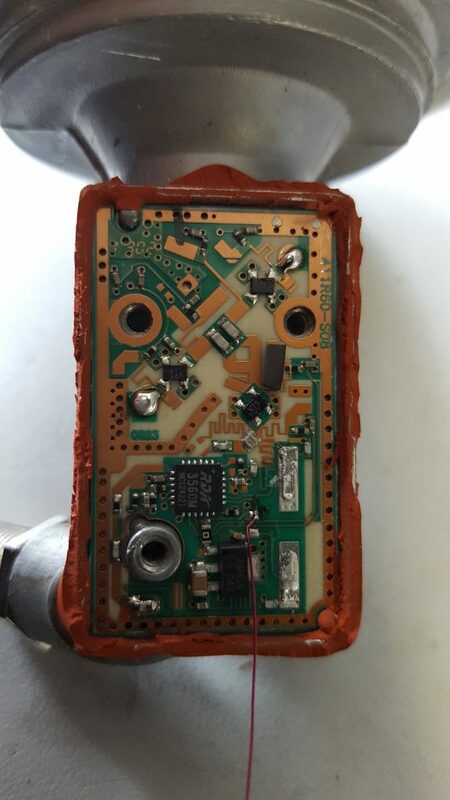 The pad with the remaining capacitor towards ground needs to be connected to the output of the 5V regulator. It is the regulator pin with the 0 ohm resistor. The pins of the TCXO are assigned as: 9=VCC (left of the capacitors), 4=GND, 5=Output. Below i add some short videos i made. 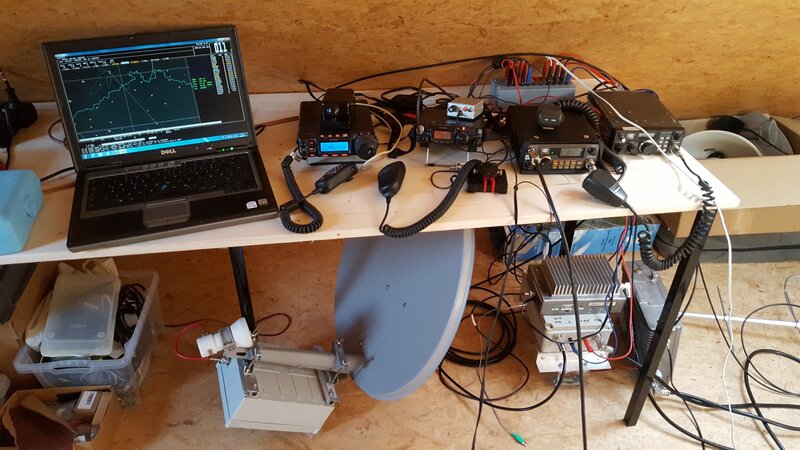 The first two show transmit and receive operation of the PlutoSDR in the 6cm amateur band. 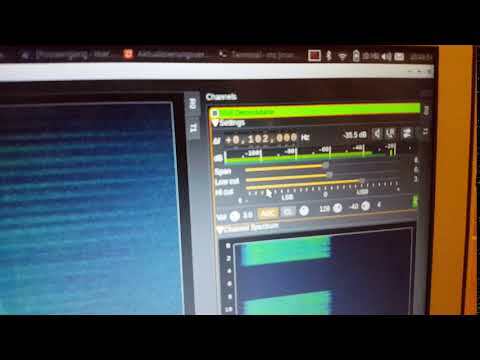 I used the great sdrangel software. The opposite side is my normal 6cm rig consisting of a FT-817 and a DB6NT transverter. The third video shows 3 of the DM0TUD microwave beacons that are located close to my home. It is from right to left: 13cm (FT-290), 3cm (FT-790R2), 9cm (FT-817). 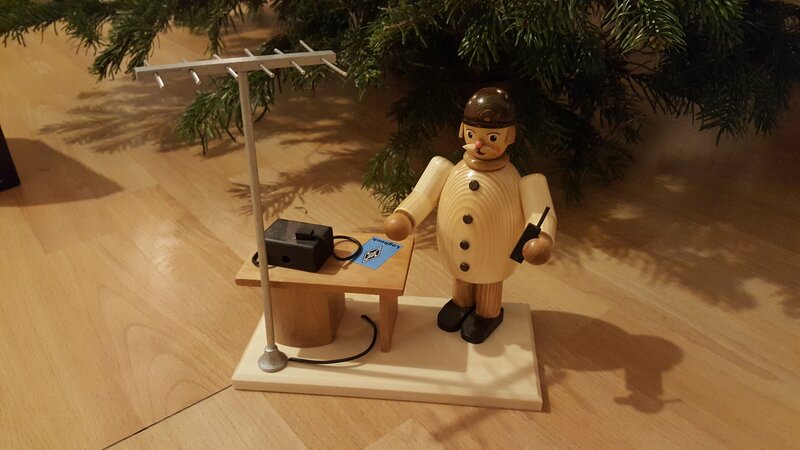 This is an traditional figure from the Erzgebirge. OM seems to do VHF contesting which is also popular there ;) But maybe not only the OM is smoking but the transceiver as Wellness eventually. Merry Christmas to all of you! German BNetzA released notifications 414/2018 and 415/2018. Those extend the permission for class E operators to work in the 13 and 6cm band as well give a new permission for 4m band access in DL. On 4m class A will be allowed from now on to Dec.31 2019 to work between .150 and .200 with 25W ERP max. Working from home again. Only south direction 140-220°.It seems the participation in that direction was not that good. I need to put some antenna over the roof for 23cm at least. Right side: yagies for 23/13cm, panel for 9cm. Left dish for 3cm. On the floor in the right corner dish for 6cm. Part time qrv from new QTH. Good takeoff direction south and nord. Only working direction south with very limited setup. Recent days showed some more sporadic E conditions. I worked EA and LZ. 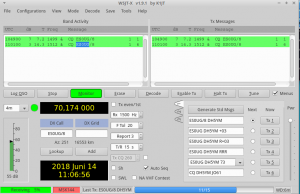 Monday evening i went away from the PC and when i returned i saw a CQ from 9K2YM. Unfortunately it was too late. 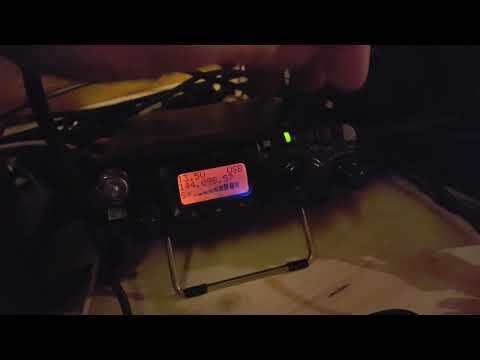 Later on i also catched a CQ from S01WS. PSKReporter showed some really interesting spots by DK2EA. He received stations from the Carribean sea and others received transmissions from Japan and eastern China. 4m ES condition on July22 2018. BTW: the very nice and useful DXMaps page has changed to openstreetmap. Now its possible to show screenshots which was not possible because of license restrictions before. Thank you very much! This week some people from here work from Estonia under the call ES0UG (and ES0UG/8). Since there are no good ES conditions currently we tried MSK144 meteor scatter. I did not think there will be a lot success since i can only run 25W ERP. But finally i god some of their CQ. During my lunch break i did not have success. In the evening we tried again and were able to complete the QSO to KO18 field within about 1.5h. Since yesterday evening the crew is qrv from the next island in KO19. We tried again in MSK144 and this time we had bursts rather early. 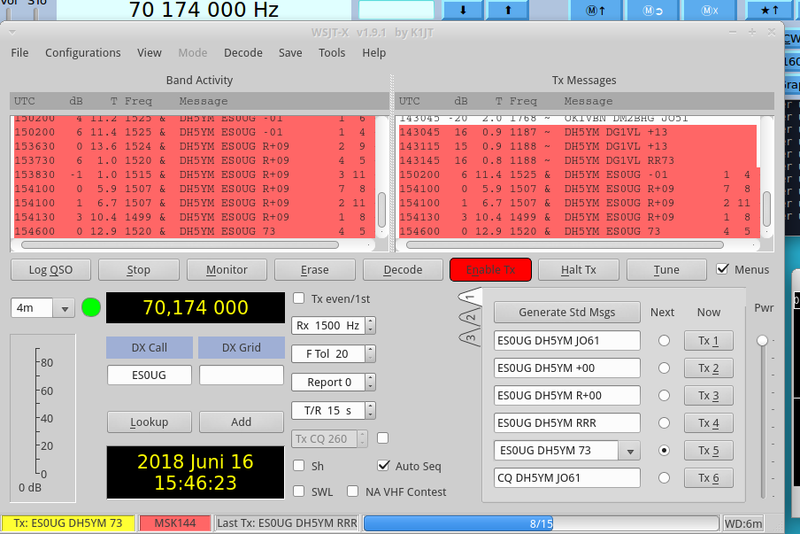 It still took more than an hour to complete the QSO and this time i have a nice screenshot. Since i did not expect that it will work at all i am quite happy with my first two QSO via MS. I also got some spots from G3SHK. Many thanks! This evening great ES opening to EI and G. And a surprise in between with S01WS. 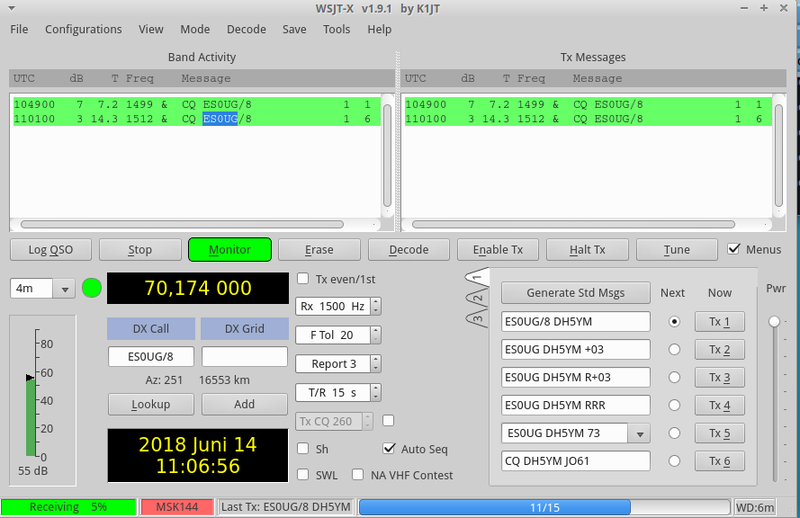 In the screenshots 23cm is displayed as QRG. This is because i use a wrong transverter setting in my SDR software which is taken over by WSJT via hamlib.